The Deschutes Collaborative Forest Project is a volunteer stakeholder committee that oversees special landscape restoration demonstration projects, one of only 20 such groups in the nation. The group was established by Congress to encourage collaborative, science-based ecosystem restoration of key forest landscapes. Merry Ann’s defined strategic communications priorities and rolled out projects that advanced the group’s goal to speak effectively about forest health. Foundational work included a one-page message platform that defined DCFP’s brand personality, audiences, Mission, Vision and Elevator Statements and SEO keyword phrases. Target audiences were closely defined, with full persona sheets developed for three key audiences. Merry Ann developed a new tagline–Restoring balance in our forests–and hired Bold Ampersand LLC to create a new, high-impact logo. Merry Ann developed new web content around a WordPress theme, assisting in the development of a robust site incorporating slideshows, video, team bios, blog and project descriptions. 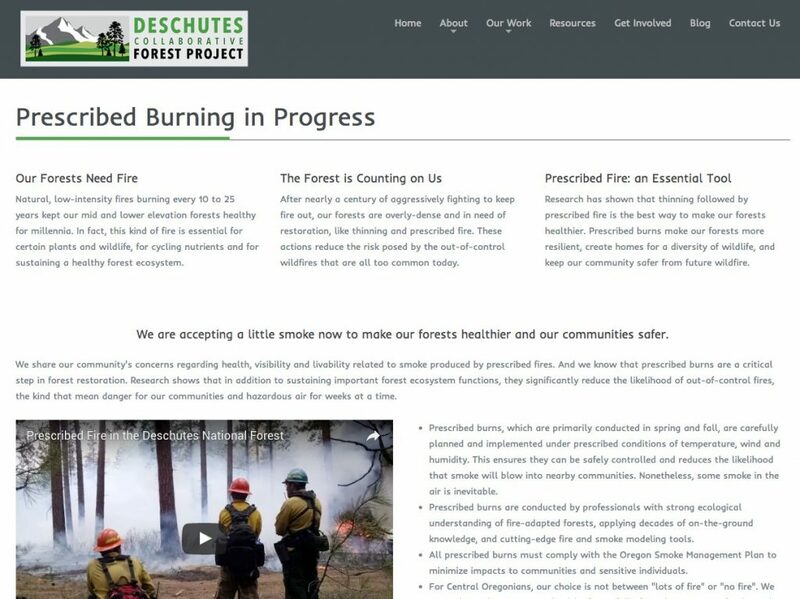 The Deschutes Collaborative Forest Project team hosted meetings, field trips, presentations and conducted a vast awareness campaign to get buy-in for this project while the employees of the Deschutes National Forest put in literally thousands of hours planning, and now, implementation. This is a true demonstration of how well we can do when we build community support for restoration and how that allows us to increase the pace and scale of restoration in the future. Merry Ann provided a broad range of strategic communications--message platform, personas, rebranding, web content--for a collaborative comprised of 19 forest restoration stakeholders.